Joe Banks, former AHRC Research Fellow at the Institute, is out and about over the next month or so, promoting his Rorscach Audio project. The Times Literary Supplement has reviewed the “Rorschach Audio” book as “engaging… packed with interest” (TLS 5707, page 30), the project’s research archive is also on-line, and talks are now confirmed for The ICA, London, 15 Sept 2012 (as part of the closing events for Bruce Nauman’s exhibition “Days”) and at the Liverpool Biennial, 6 Oct 2012, organised by Mercy. The Canadian psychologist Albert Bregman’s theory of Auditory Scene Analysis describes how the human mind is able to identify, focus on, isolate and extract streams of actually or potentially meaningful sound information, which it recognises as emanating from discreet sources, using analysis of what amounts to the musical content of specific “melodic streams” within environmental noise. In terms of evolutionary biology, the theory suggests that our capacity for appreciating music may have evolved at least in part as a by-product of the mechanism that enables us to identify sound-streams that come from, say, a distant river, particular types of bird-song, or the call of a potentially hostile predator etc; and in human communications this faculty is most obviously in evidence as a contributory factor in enabling us to perceive individual speakers in crowded social environments (the Cocktail Party Effect). In terms of everyday experience, the isolation of such streams may seem deceptively simple, but in information theoretic and signal processing terms, the level of computational power required to extract such invariants* from the distorting influences of complex and rapidly-changing real-world sound environments still challenges engineers and computer scientists. Problems associated with extracting invariants from noisy environments are of particular relevance to air traffic control, military fighter and helicopter communications and battle management systems. Generalities aside, the soundtrack used in the Disinformation + Usurp “Sun Rays” film is a direct recording of the real sound-ambience of the film’s location, “composed” using sharp graphic-equalisation only, to reproduce the subjective experience of the melodic streams that were perceived in the extraordinarily atmospheric ambience of that underground space (and, totally coincidentally, the title of this film, which is taken from the footage itself, is also the name of the Indian Air Force military aerobatics demonstration team). Filmed in New Delhi, Oct 2011. (J. Banks, IMCC Westminster, 1st Nov 2011). A fine radio interview with our AHRC Fellow Joe Banks on ‘The Arts on Sunday’ in New Zealand. Wednesday 30th March 2011: Joe Banks is providing a ‘Rorschach Audio’ soundtrack for painter Makiko Nagaya’s drawing performance at the Superhybrid Dada event organised by curator Peter Lewis in Leeds. Wednesday 13th April 2011: a ‘Rorschach Audio’ lecture features in the Living Room festival organised by University of Auckland, Gus Fisher Art Gallery curator Andrew Clifford in New Zealand, to accompany the National Grid sound installation that will be exhibited there. Visual and sound and artist Joe Banks, based as an AHRC Research Fellow in the Institute, discusses the Spiritualistic phenomena explored by his “Rorschach Audio” research project, exploring Jean Cocteau’s Orphée and Art and Illusion by EH Gombrich in relation to Electronic Voice Phenomena (ghost voice) recording. The presentation focuses on perceptual psychology aspects of its subject matter – including live demonstrations of audio illusions and of related psychoacoustic phenomena – with a second presentation focusing on related literary themes to follow this Autumn. Never one to rest of his laurels, soundscape-ist Joe Banks is out and about in the next six weeks. He’s underground in Hackney, improvising at The Chelsea Theatre on the Kings Road, and noise-making in Harrow. Catch him if you can! ‘Film/ Music/ Other’ (Music Orbit Series 2) Disinformation and the Music Orbit Ensemble – Steve Beresford, Joel Bell, Francesca Thompson and Ben Crawley, improvising live scores to the films ‘Spellbound’, ‘Fire in the Eye’ and ‘Blackout’ by Disinformation. Programme includes “Electronic Labyrinth THX1138 4EB” – the first experimental short by director George Lucas and legendary sound-designer Walter Murch, the extraordinary ‘C’était un Rendezvous’ by the French Jewish-Algerian film-maker Claude Lelouch, ‘The Elephant and the Ship’ and ‘Monet’s Dream’ by artist and composer Ian Harris. Presented by Music Orbit in association with Brunel University and the PRS Foundation. Bus – 22 or 11 heading west from Sloane Square tube (get off when you see the ‘World’s End Distillery’ on your left). Usurp Arts Lab – performance, electronic music, documentary film, painting, sculpture and installations by Daniel Ackie, Blue Daisy, Sarah Cramer, Disinformation, Katy O’Donovan, Sarah Fowler, Reynir Hutber, Dilaksky Kandasamy, Natalie Leer, Isabel & Sophia Moseley, Aleesha Nandhra, Sheena Patel, Alice Turner, Aoife Twomey, Simon Underwood and Rich Watson. Usurp Gallery is 2 mins walk from West Harrow tube, 20 mins from Baker Street taking the Met Line towards Uxbridge. Gallery open Thursdays to Sundays 2pm to 8pm. We are thrilled to welcome Joe Banks to the Institute for Modern and Contemporary Culture at University of Westminster, London. Joe is AHRC Research Fellow in the Creative and Performing Arts, and his current ongoing major project ‘Rorschach Audio’, studies ambiguities of acoustic perception, with particular emphasis on relationships between artistic and perceptual creativity and illusions of sound. 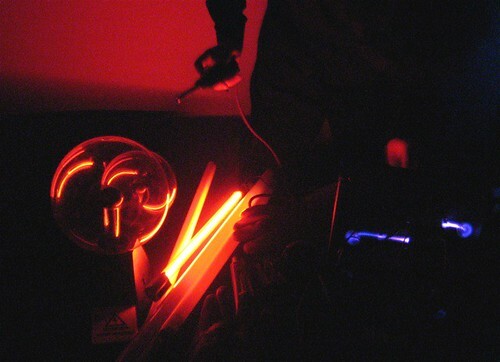 Joe’s experimental music and installation art project Disinformation recorded 8 commercially published LPs and CDs (pioneering the use of electromagnetic noise from electric and magnetic storms, live mains electricity, industrial, domestic and IT hardware, transport infrastructure and from the sun etc., as the raw material of electronic music and sound art).